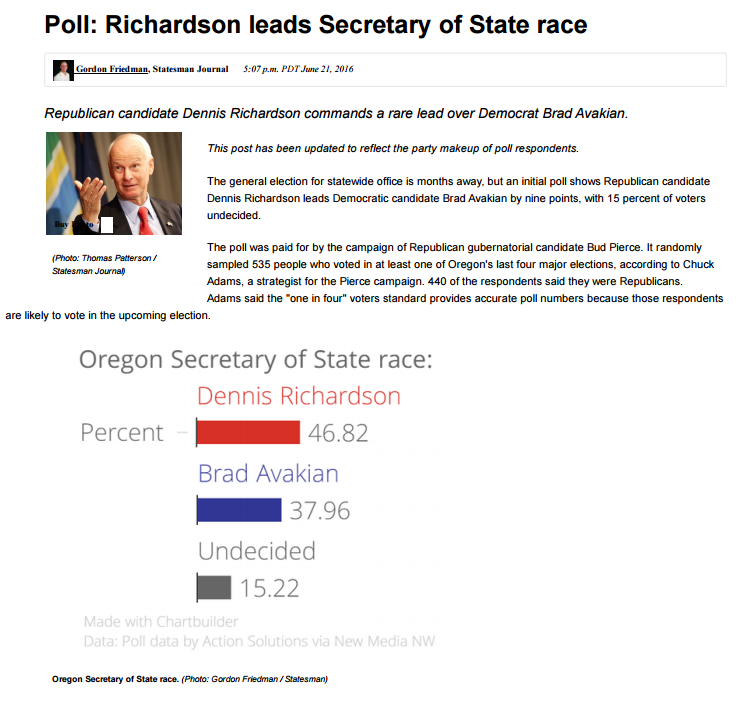 According to the story in the Statesman-Journal, Republican Dennis Richardson was up 47% to 38% over Democrat Brad Avakian in a poll paid for by GOP gubernatorial candidate Bud Pierce. It randomly sampled 535 people ... 440 of the respondents said they were Republicans. That's right: According to this "random sample" poll, 82% of Oregonians are self-identifying Republicans. HAHHAHA. Here's my question: Dr. Bud Pierce is a newcomer to politics and, by all accounts, an well-meaning (if misguided) guy. Did he know that his consultant, Chuck Adams, was shopping a bogus poll to the media? Is this the kind of campaign he wants to run?